After a long tiring day, all you need is a cup of coffee and your favorite snacks by your side, along with resting your back on the couch. Of course, this would only be achieved if there is no pile of clothes stuffed inside your bathroom bucket. Washing clothes could be a tedious task and owing to our hectic schedule we often fail to handle the simple task of cleaning. Thanks to the uber for laundry service because of which managing a household chore like laundry has become so much easier. So, how about starting uber for a laundry app? Well, you would be surprised to know that this is a billion dollar industry. It is one of the most lucrative and profitable businesses today! However, before starting one, you must follow a few strategies that would help you to establish your uber for laundry service business in the market. The first and the foremost thing that you need to do is to jot down your business plans for your laundry entity. Before starting any business, one must lay down the plans strategically. For instance, would offering special discounts on ironing and dry cleaning would be a part of your services? In this way, you can make your business plan unique, so that your app stands out of the crowd. Your business planning list should include all the services that your laundry app would provide. Keep in mind that while charting your business plan, you need to be very clear about your services. This would keep your business on track and well-organized. Before you initiate your business goals, go for extensive research on the laundry market. Study more about the statistics of the laundry business in your region. It is very important for you to know about the demand for laundry services in your area. Carrying out deep and extensive market research would help you to understand user response on your brand new laundry business. You might be thinking that a laundry business is all about putting labor in washing, drying and ironing clothes; which requires a little investment. However, this is not a fact. Handling a laundry business could be quite expensive than you are actually imagining it to be. You need to make a list of all those items that you require for managing a laundry business. For instance, you should first list all the priorities tools that you will be requiring for your laundry business. This would mainly include detergent, dryers, hangers, washers, and other equipment. 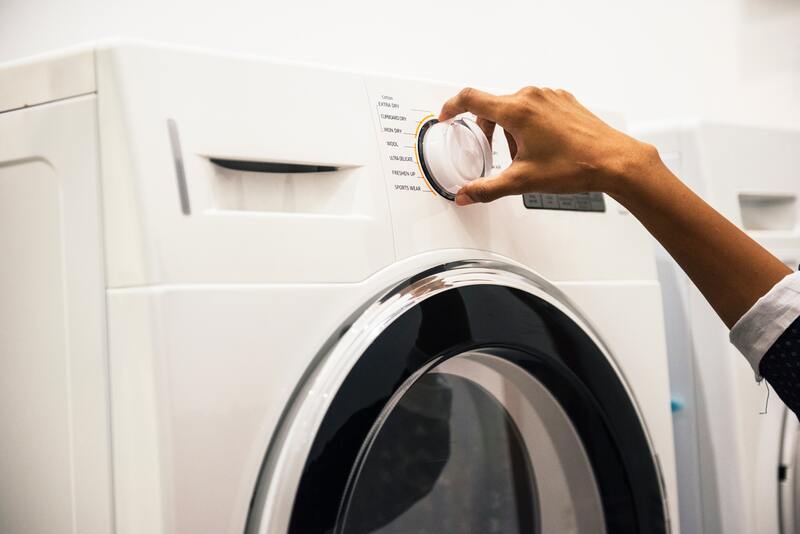 Making an investment in reliable, high-performance laundry machines is what ensures the proper flow of your on demand laundry service. Therefore, investing in good commercial washing equipment and dryers is a must thing for you to do. Having proper workable machines in your workhouse would make sure that you are delivering timely services to your customers. And offering the customers with timely services would help you to gain their trust and satisfaction. Also, opt for the right brand that is preferred by the top on demand laundry services. Different machines provide a different feature. Few machines make use of specific technology that helps detection of the clothing requirements. Related read: How To Win Millennial Customers With Your On Demand App? Like for example, it would identify if the clothes are completely dried or require more heat for drying faster. You just need to select the best machines that would cater to your laundry business requirements. Be sure that before you make any purchase, you go for comparing all the features of different machines, including the type of technology they are using. The concept of uber for laundry app is not new as several people are getting their laundry business registered under the same. Launching the laundry app is not just the solution, but providing the best services is what ultimately your business goal should be. Make sure that you are choosing a perfect place for carrying out all your laundry services. Your workplace must be closer to your customer’s location. This ensures that you are managing your business efficiently by delivering timely services. It is not necessary for you to rent a separate place for carrying out your laundry business. You can also do the same in your home, of course, if you have extra space for that. Your target customers are those who are unable to meet their cleaning requirements. For example, elderly people who are too weak to wash out their clothes for themselves. Also, there are office goers who are never able to devote their time in cleaning their clothes, even if it is a weekend. Students and working mothers also fall under your list of potential customers. For such people, the laundry business app is one of the most convenient means of getting their washing work done. In this way, you need to map out your potential customers first. The vital part of uber for laundry service is that you are not the only one to have launched a laundry startup in the market. There are several competitors of yours who have already set their foothold and are doing quite well. Your priority task should be to list out all your competitors and know their business strategies. This would help you in making your own unique strategy so that your on demand laundry services appear unique for your competitors. Initially, you can attract your customers by offering attractive incentives which would include coupons. If not this, then you can definitely go for applying your own unique strategies. All set with your business planning list? Well, now it’s time to choose the best laundry app development services of the town. 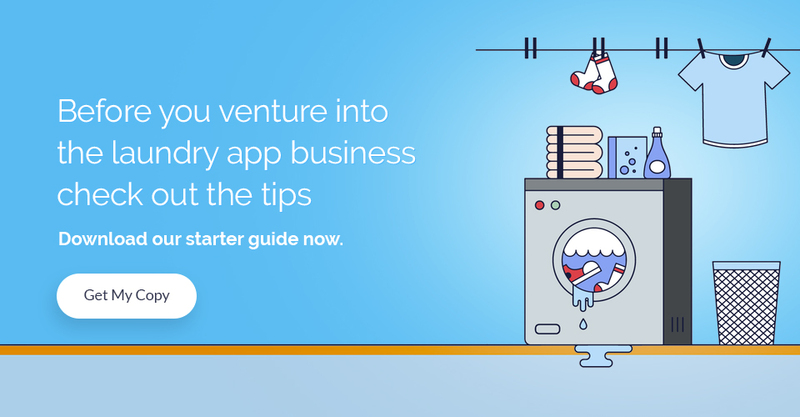 Create a laundry app for your business as soon as you get hold of your app developer. There are several app developers who can do the task of laundry app development for you. 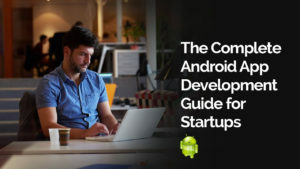 But you need to ensure if the service provider is meeting all the prerequisites that make them unique in their app development prowess. Always go for the ones who are experienced in this field and has a commendable portfolio. Also, they must be able to understand your business requirements and other related demands. Done with all the above points? Now, this is the final step of initiating your business- “Marketing”. Marketing is a loaded business term which aims to make revenue at the end. Thus, marketing your uber for laundry service is a must thing for you to do now. And it’s up to you which medium of marketing you opt for. 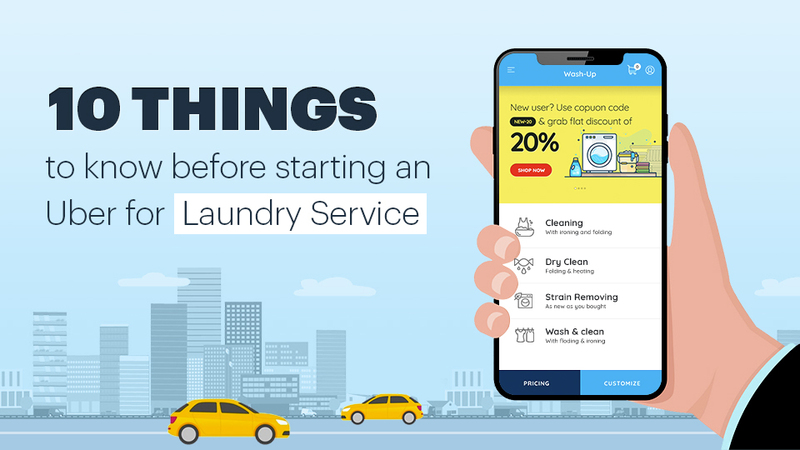 Right from distributing fliers to getting your business app launched, your uber for laundry app must be advertised in endless ways possible. Whoala! Your marketing campaign is finally done and you are all set to open your shop now. Your app is ready to start with taking orders from the customers. Prioritize the needs of your customers, ensure timely laundry delivery, make use of better and high-quality products for washing. Overall, ensure that your customers are getting damage-free, clean, ironed, neatly folded clothes. Try not to keep any loopholes from your end by making your clients disappointed. If there is a glitch in your business, you can always cover that up with marketing techniques like cashback offers. Whatever it is, you have to make sure that your customers are impressed by your laundry service at first go. Want To Start An Uber For Laundry App? Go For It Now. Laundry app has really helped people in managing their dreary household chores like washing clothes. This the reason why more and more people are preferring the uber for laundry services to free themselves from this extra cleaning burden. Different laundry startup is entering into the market sphere and enhancing their uber for laundry services. This is done by applying various useful business strategies that ensure retaining the customer’s reliability and satisfaction. So, now when you have known all the major aspects of beginning your laundry service, then just go for it immediately. Without giving a second thought, create your laundry app today by connecting with our developers. 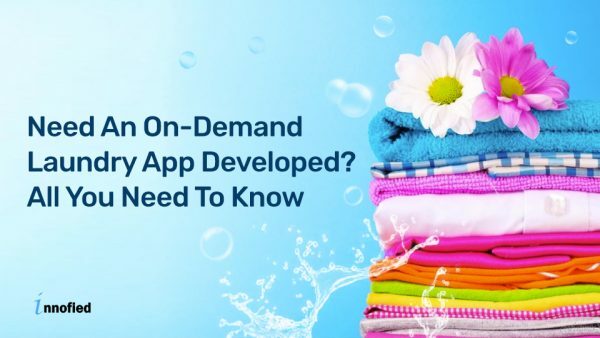 At Innofied, our app developers make sure that you get the best laundry app development solutions. Uber for laundry services is a worthwhile investment that you are going to make. Therefore, without any delay, get your laundry app developed by our developers today. 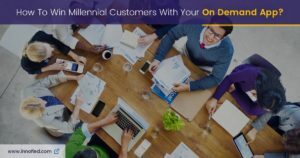 How To Win Millennial Customers With Your On Demand App?